Some people have a knack for playing it neutral, or in the very least being impartial so that they can judge a situation more accurately. Others have a hard time keeping their own emotions and beliefs out of the equation. 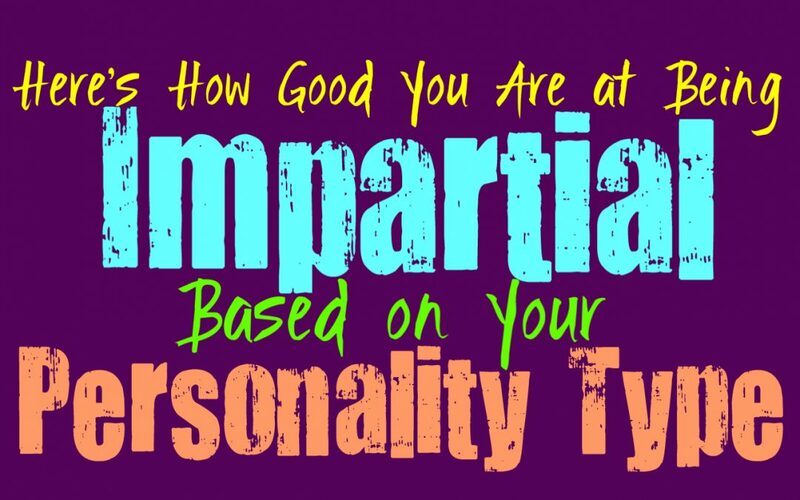 Here is how good you are at being impartial when needed, based on your personality type. INFJs can be logical people when it comes to some things, but in other situations being completely impartial just doesn’t fit who they are. They may be able to approach a situation from an impartial point of view, but that doesn’t often last all that long for them. While the INFJ can see the more unbiased truth of a situation, they do sometimes allow emotions to get in the way. They care about others and believe in doing the right thing, even if it isn’t always the most logical thing. Sometimes their morals can be more shades of grey than black and white, which can sometimes cause them to be a bit less impartial in any given situation. ENFJs don’t usually find it easy to be impartial, since they are often guided by the emotions of others. Even if a situation calls for an unbiased opinion, ENFJs struggle to keep emotions out of the equation. While they can logical assess what is in front of them, they still don’t tend to make their final decisions based on that information. ENFJs simply believe in doing what is best for their loved ones, and they want to do what they can to ease the suffering of those around them. For the ENFJ how something will emotionally affect others, is just far too important for them to be completely impartial. INFPs definitely aren’t great at being impartial, since their beliefs and morals come from within. They have strong inner beliefs and they don’t like having to ignore them for anything. INFPs are aware that this might make them a bit bias sometimes, but it doesn’t often change their minds. They are capable of assessing things logically, but they believe in following their hearts and doing what they know is right. INFPs might not be impartial judges in most situations, but they stand firm to what they believe in and will not allow outward forces to change who they are. ENFPs are rarely impartial people, since their own inner emotions and beliefs affect their judgement. They simply believe in following their hearts and doing what they know to be right. This might make the ENFPs beliefs and opinions a bit bias, but it is right for them. They simply don’t like allowing others to sway their beliefs and judgement, since this can hold them back from being who they truly are. For the ENFP it is important to follow their own inner morals, instead of constantly focusing on what others belief to be “logical”. INTJs can certainly be impartial if they need to be, and will do their absolute best to keep their inner beliefs out of the situation. Instead INTJs want to use their intuitive abilities to approach the information from a much more accurate point of view. They don’t like allowing emotions of even morals to get in the way of understanding something, even if in the end their morals help them make the final decision. INTJs want to approach everything from an unbiased and impartial angle, so that they can assess the information in front of them sincerely. ENTJs are often capable of being impartial, especially in situations where it truly matters. They know how to assess information without using their own feelings, and will do their best to keep emotions out of it completely. ENTJs are often very good at approaching most things with a logical and unbiased mindset. They want to be as efficient and accurate as possible, since this is truly important to them. ENTJs realize that everyone has times where they can’t be completely impartial, but they are often capable of recognizing that and will take a step back. INTPs try their best to be impartial when they are assessing information or trying to expose the truth. They do their best to remove emotions from the equation completely, and instead just focus on the information at hand. Sometimes INTPs can become a bit uneasy with their own impartial capabilities, but in truth they can often assess things from a logical standpoint. When INTPs aren’t emotionally invested in something they naturally find themselves being completely impartial. There may be some instances where feelings might seep into their beliefs, without them entirely realizing this is happening. ENTPs are often good at being impartial, since they try to focus on the facts of a situation. They also do their best to recognize when they aren’t entirely capable of being impartial. ENTPs try to approach things in a way that they can do their best to avoid being bias. They want to uncover information from every single angle, instead of just the one that seems to make the most sense. This helps the ENTP see every possible answer, and definitely helps aid to them being much more impartial. ISTJs try their best to be impartial when it comes to getting things done and being efficient. When they are at work they can often be very unbiased and impartial, since that is what is needed. They are efficient and focused people who will do whatever it takes to get the job done. When they are making life choices ISTJs don’t always want to be impartial, since they do have inner morals and goals that they want to follow through with. ESTJs can certainly be impartial when it comes to getting things done and being efficient. They believe in putting emotions aside so that they can get the job done to the best of their abilities. When it comes to their goals and the things the ESTJ believes in, they can sometimes struggle to be a bit impartial. They try to avoid allowing their emotions to get in the way, but ESTJs can be somewhat stubborn people. Their hardheaded behavior can make it challenging for them to be entirely impartial in most situations. ISFJs can struggle to be impartial in most situations, since they have strong inner beliefs. ISFJs often have firm beliefs and convictions which they don’t like steering away from. They also follow whatever will provide for their loved ones and create a happy environment for them. ISFJs want to create a happy home, and believe in doing their best to create harmony around them. This often makes it truly difficult them to actually be impartial in most situations, and they are often okay with that fact. ISFJs would often rather do what they believe is right, than be unbiased. ESFJs aren’t usually good at being impartial, since emotions are their main focus. They might not focus much on their own inner feelings, but they do care deeply about their loved ones. For the ESFJ it is often more important to be connected to a situation and make a choice based on that. They don’t like doing anything that might hurt or upset others, and so this makes it rather difficult for them to be impartial in most situations. Even if they are capable of seeing things from a logical and completely unbiased point of view, they usually throw that out the window when it comes down to making others happy. ISTPs are actually capable of being impartial in most situations, especially if it doesn’t involve their loved ones. They can often step into a situation with a sense of logic and reason. ISTPs enjoy using facts and information in order to figure something out and make the right choice. While there are times when they follow what is most exciting a bit more than what is logical, that doesn’t mean they aren’t capable of being impartial and unbiased. ESTPs try to be impartial, but they are rather stubborn and sometimes hotheaded people. This can make it difficult for them to really be impartial, since their own feelings and beliefs can cloud this. While ESTPs do like looking at facts and believe in following the truth, that doesn’t mean they are completely impartial. They can often approach things from a logical point of view, and will do their best to focus solely on the facts of a situation. When sometimes occurs that causes them to feel competitive or even a bit heated, the ESTP will struggle to be impartial. ISFPs just aren’t impartial people, since they believe in following their hearts and souls. They do whatever they believe is right and have rather strong inner morals. For the ISFP being impartial feels completely wrong, and goes against who they are as a person. They follow their hearts and their emotions often guide them through life. Even if they can logical assess a situation, they would much rather be focused on what they feel. ESFPs aren’t very impartial people, since they follow their hearts and inner morals. ESFPs do what feels right for them in the moment, and don’t like being impartial with anything. They would rather follow their own hearts, than have to focus on what others believe to be true. While ESFPs are capable of being factual, they prefer to do what feels right, instead of following these so called facts. ESFPs just aren’t made for being impartial, since it can really go against who they are as people.